What can Rolfing do for Carpal Tunnel and Thoracic Outlet Syndrome? If you’ve never heard of thoracic outlet syndrome, it can be quite an intimidating term. However, it’s a relatively simple issue that can have some serious repercussions in the body. What causes carpal tunnel and thoracic outlet syndrome? There’s one important distinction we need to make here: do you have true carpal tunnel syndrome or do you have thoracic outlet syndrome? “True” carpal tunnel syndrome is characterized by a narrowing of the carpal tunnel - the area in the wrist through which the tendons and nerves run. This can cause moderate to severe pain in the hands, wrists and forearms. It’s especially common in people that type frequently throughout the day. The solution for this unfortunately generally requires a minor surgery to open up that channel so the nerves will no longer be compressed. If you’re not a fan of surgeries (who is? ), this may not be the best of news. However! Don’t fret yet. Often times the symptoms associated with carpal tunnel are the same ones associated with a lesser-known ailment: thoracic outlet syndrome. The good news here is that thoracic outlet syndrome is generally much easier to fix. Essentially, thoracic outlet syndrome is compression of the thoracic outlet - the area on the tops of the shoulders between the collar bone and the shoulder blade: This is an area with a very important anatomical feature: the brachial plexus. The brachial plexus is a gathering of nerves (a plexus) that comes out of the spine and then innervates (or communicates with) various structures in the arms, shoulders, and chest. 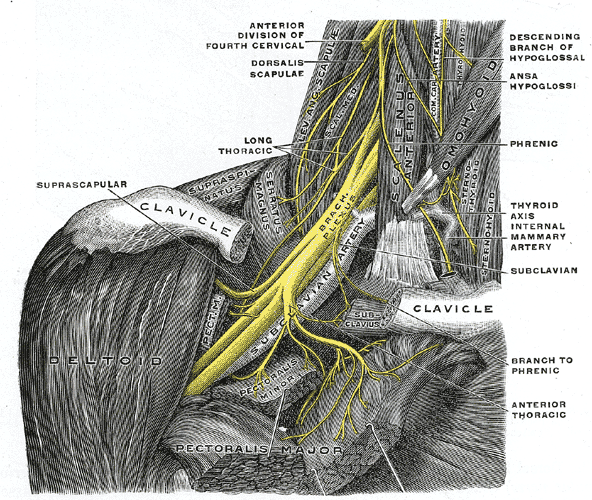 This is important for our context because several of these nerves run down to the hand and the wrist. When the brachial plexus is compressed by stress, poor posture, carrying a purse or bag, injuries, or anything else, it may cause irritation or numbness in the nerves that may be felt anywhere from the shoulder blade to the wrist. What do we work on during a Rolfing session or series? In a Rolfing session, we work to “free up” the thoracic outlet area. We work all of the structures and fascia around the shoulders and the neck to allow freedom so that the nerves will no longer be compressed. As you can see, there are numerous layers to the neck and shoulder area. The result of this “freeing up” is multi-faceted: first, as said above, the nerves will no longer be compressed, allowing them to heal and return to their natural, pain-free state. Secondly, there are great benefits to balancing out the shoulder area: better posture, less stress felt in the shoulders, less soreness, and changes in the relationship between the shoulders and the neck. If you’ve been having neck issues, this is a great side-benefit. What do I do after Rolfing? First, it’s important to recognize that it does take time for these things to heal after removing the physical limitations (aka “freeing up” the fascia). Nerves heal relatively slowly, so you may continue to feel the symptoms for some time after the session. Every body is different, so it will be a different amount of time for everyone. Second, a large part of what we’ll talk about in the Rolfing session is how to change your habits that caused this area to become compressed in the first place. The best thing you can do for yourself is to change your habits for the better. Now that your tissue is physically released, your body will be free to move and relax in new ways. Training yourself to recognize these changes and utilize your new range of motion will be one of the best factors in keeping yourself out of trouble in the future. Disclaimer: Every body is different. As a Rolfer, I work to help people based on their individual needs. There is almost never a one-size-fits-all technique when it comes to balancing the body. As such, what is said here is very generalized, and is meant to give you a better understanding of what is going on rather than diagnose or treat any specific ailment.